Claim to Fame: Writing songs for numerous artists. "Hold My Hand" is the third single from reggae artist Sean Paul's album Imperial Blaze. It was released in the United States on November 23, 2005, the film being targeted at the traditionally large Thanksgiving weekend audience. Sophia Cristina Aguiar is a dancer, choreographer and actress. Loso's Way is the fifth studio album by American recording artist Fabolous, released on July 28, 2009. Esther Renay Dean, Better known by her stage name Ester Dean is an American songwriter, singer, rapper, actress, and record producer. The song features Timbaland, who wrote the song with Hilson and her songwriting/production team The Clutch, as well as Walter Milsap. MTV Top 100 Hits of 2008 is the TV show that aired in December 2008 on channel MTVAsia. The publication was originally a website devoted to hip hop, until Lazerine decided to pitch the possibility of a magazine to several publishers. Now That's What I Call Music! 26 was released on November 13, 2007. The song is produced by Ryan Leslie, who is also heard on the intro. The American Music Award for New Artist of the Year has been awarded since 2004. Small minority of Kru also live in Southern Sierra Leone close to the border with Liberia. As of 2014, Lil Wayne has won 3 awards total, the most of any artist in this category. Lyrica Anderson is an American singer and songwriter. David Rams is a music, celebrity and beauty photographer. Now That's What I Call Music! 32 was released on November 3, 2009. Kidz Bop 17 is the 17th edition to the Kidz Bop series and was released on January 26, 2010. The Clutch was an American collective of songwriters responsible for a series of successful singles including Omarion's "Ice Box", Ciara's "Like a Boy", Timbaland's "The Way I Are", Britney Spears' "Radar" and Justin Bieber's "One Less Lonely Girl". Now That's What I Call Music! 73 or Now! 73 is a double-disc compilation album which was released in Ireland on July 17, 2009, and in the United Kingdom on July 20. "Patron Tequila" is a song by The Paradiso Girls featuring Lil Jon and female rapper Eve, intended to appear on their debut unreleased studio album, Crazy Horse. The BET Awards were established in 2001 by the Black Entertainment Television network to celebrate African Americans and other minorities in music, acting, sports, and other fields of entertainment over the past year. The I Am Music II Tour, was a North American concert tour headlined by American rapper Lil Wayne, and with several special guests. Hoodstar is the third studio album by the hip hop star Chingy, following the release of Powerballin'. The song features rapper Snoop Dogg and was produced by the Stereotypes and The Smeezingtons. Mosley Music Group is a record label founded and formed by producer Tim "Timbaland" Mosley. The album is the 12th edition of the Canadian Now! series. This particular version includes "the best of 2007", featuring the best music from the 2007 So Fresh compilations. He has directed many music videos for popular artists. "Doin' It" is the second single from LL Cool J's sixth album, Mr. It was recorded for Nelly's fifth studio album, Brass Knuckles, and the deluxe edition of Fergie's debut album, The Dutchess. The Pop 100 was a songs chart that debuted in February 2005 and was released weekly by Billboard magazine in the United States until its discontinuation in 2009. The song features Keri Hilson. Radio 1's Live Lounge – Volume 6 is a compilation album consisting of live tracks played on Fearne Cotton's BBC Radio 1 show, both cover versions and original songs. 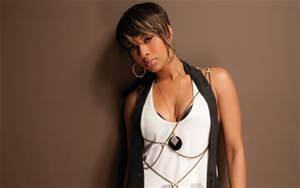 "Breaking Point" is a song performed by American recording artist Keri Hilson from her second studio album, No Boys Allowed. In 2010, he made is feature film directorial debut with the comedy film Lottery Ticket, starring rappers Bow Wow and Ice Cube. He signed with Pretty Lights Music in December 2010, and released his first album Levitate on January 25, 2011 Luther Brown is a Canadian choreographer/artistic director. Maurice Richards, better known by his stage name Rich Boy, is a rapper from Mobile, Alabama. The song features vocals by singer Keri Hilson and rapper D.O.E.